Before visiting Jakarta three years ago, I read someplace that the Indonesian capital may be the largest city in the world without a metro railway. A couple of other cities could contest that claim, but Jakarta is certainly one of the biggest metro-less cities. Instead of a metro railway, Jakarta has the Transjakarta Busway, a hybrid transportation technology that is effectively a bus metro. The buses run in their own lanes and stop at stations that can only be entered with a smartcard. The bus doors are high off the ground to meet the station platforms, so it is only possible to board the buses through the stations. There can still be quite a gap between bus and platform, more than on any metro I’ve ridden. 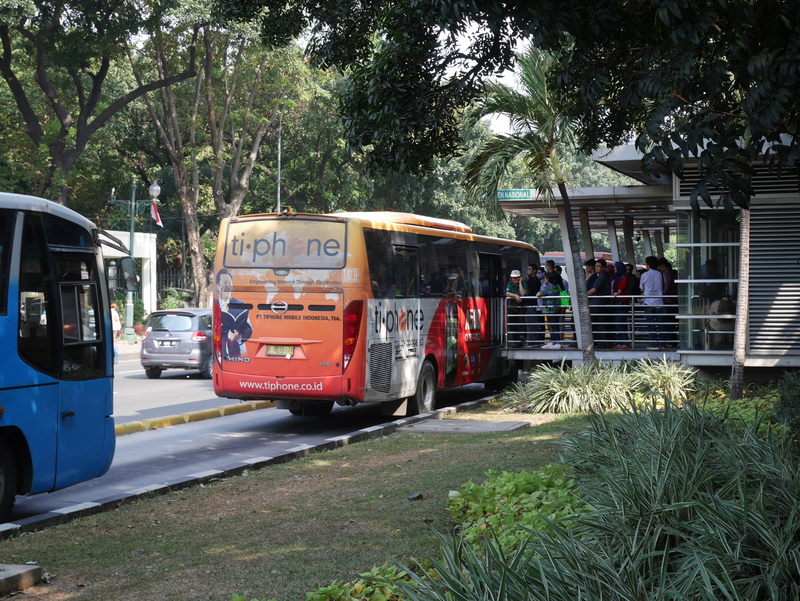 Buses at a Transjakarta station. A dedicated busway lane on Jalan Gunung Sahari. Interior of another busway station. 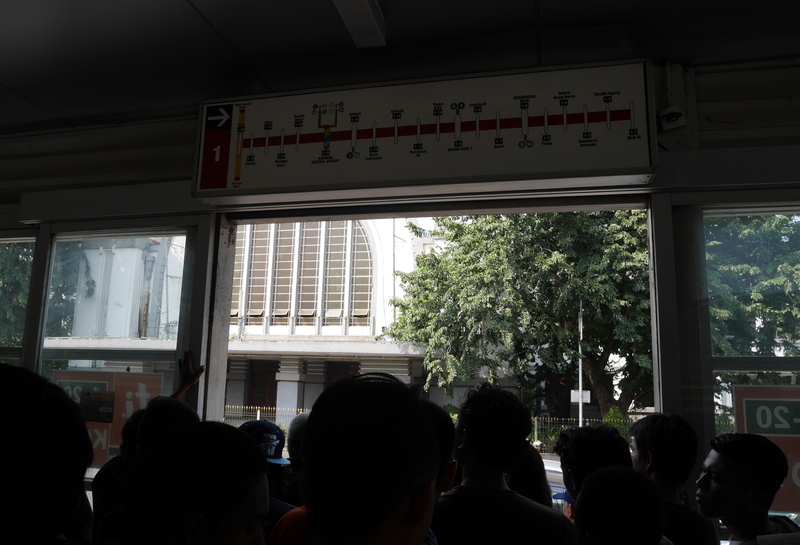 At its best, the Transjakarta Busway is faster and more efficient than regular buses, which are at the mercy of all the other traffic in a city. It was also much cheaper to build than a metro railway, because the buses run on existing roadways rather than purpose-built tunnels. At its worst, the busway may not offer much advantage over regular buses, because traffic doesn’t always stay out of the designated bus lanes. Jakarta was the first place I saw a busway, but then when I went to Yogyakarta in south-central Java, I found a small busway system in that city as well. 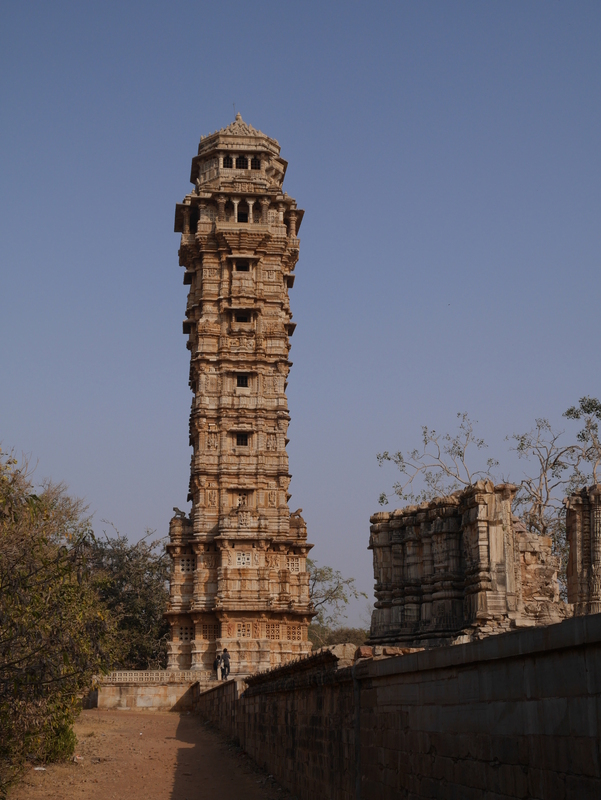 When I moved to Jaipur later that year, I saw what appeared to be the ruins of a rapid-transit bus system. On one of the roads on the western side of the city, buses ran in their own dedicated lanes, but the lanes were not always open, and at other times non-bus traffic infiltrated the lanes. 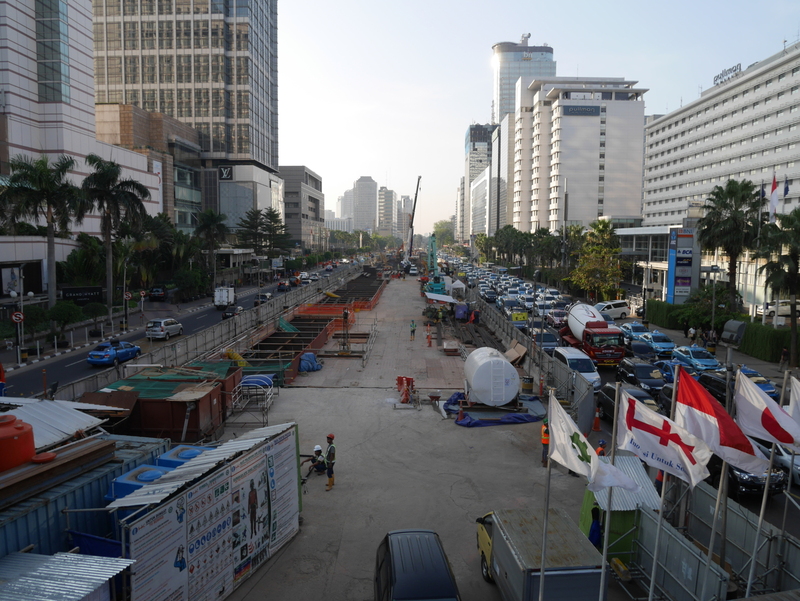 To return to Jakarta: there is a metro railway under construction in Jakarta, but it has yet to open. 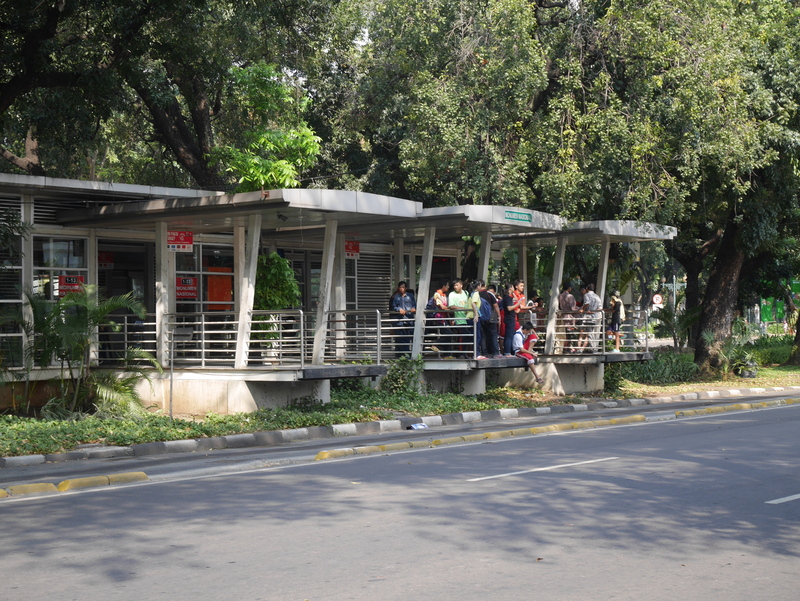 When it does, the Transjakarta Busway will probably continue to operate alongside it. 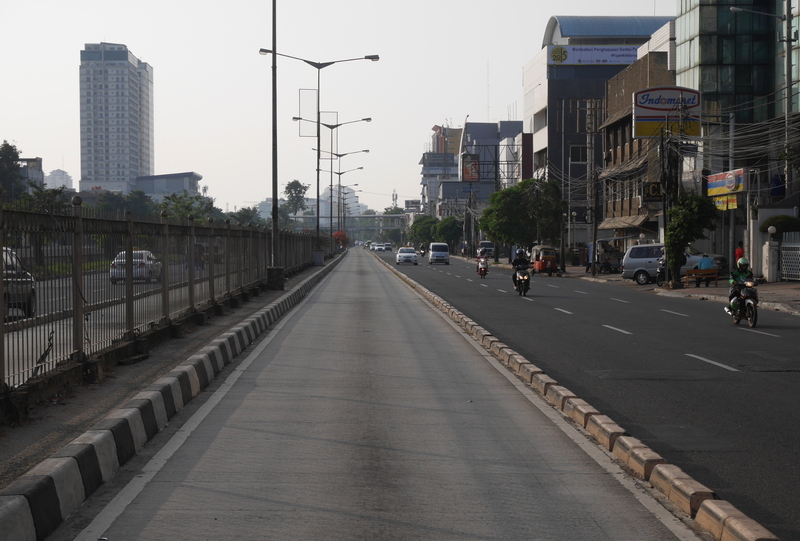 Metro construction on one of the boulevards of Jakarta, 2015. Indonesia has two other public transportation technologies that are worth mentioning: ojeks and becaks. Ojeks are motorcycle taxis. The passenger sits on the back of the motorcycle behind the driver. Thanks to their narrow profile, ojeks can weave through traffic. I understand that motorcycle taxis are common elsewhere in southeast Asia. 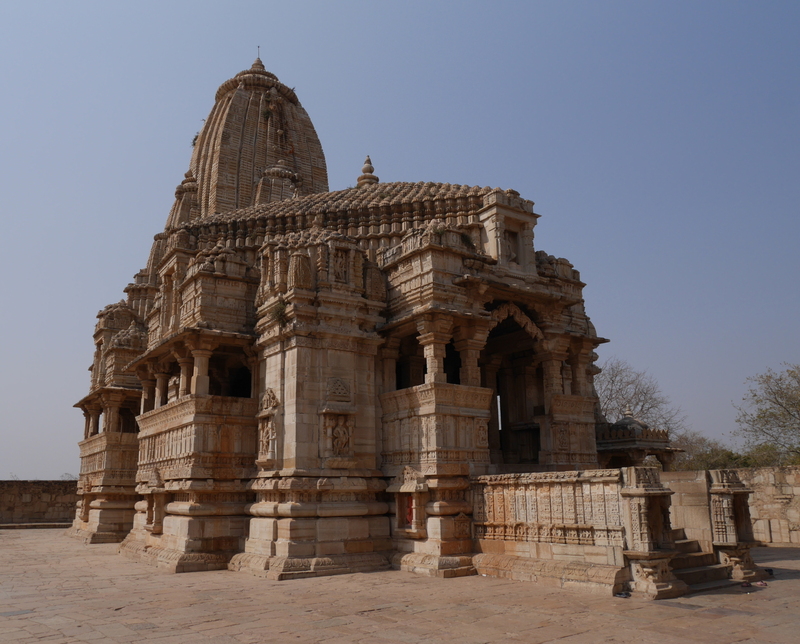 It seems that they could be popular in India as well, but they have not caught on there for some reason—possibly because they would not be practical for women traveling alone. 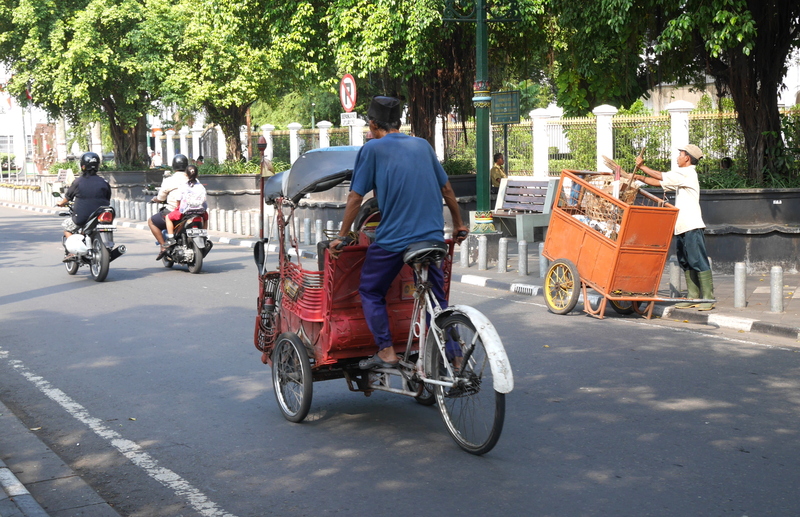 The other distinctively Indonesian mode of public transit is the becak, a three-wheeled cycle-taxi. (The c in “becak” is said like ch in “change.”) Unlike the cycle-rickshaws of India or the trishaws of Malaysia, becaks have a passenger seat in the front, and the driver sits in the back. The use of becaks has fallen off considerably in recent decades, but they are still around, especially in touristy areas. 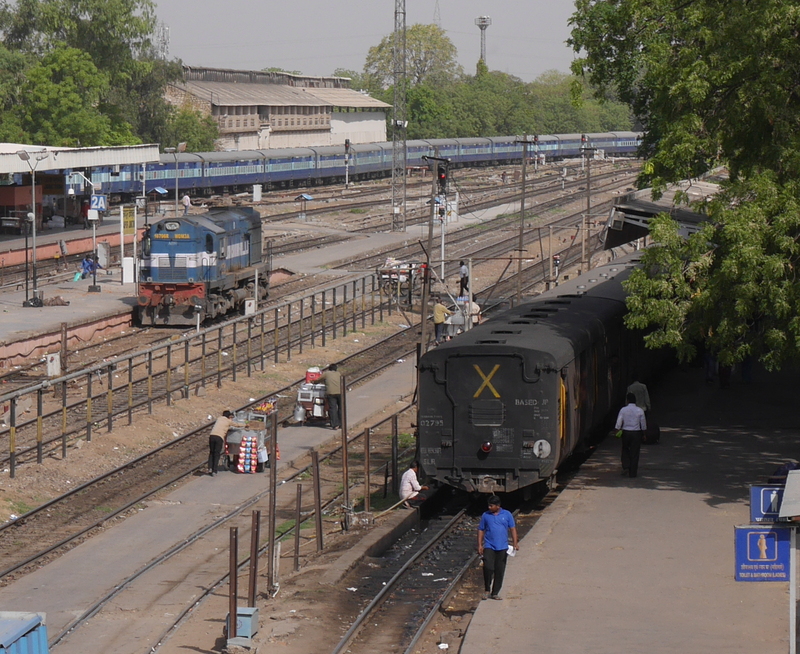 Broad-gauge (left) and meter-gauge (right) trains at Jaipur Junction. When private British capital first started building railroads in India in the mid-nineteenth century, the lines were built in broad gauge. With a spacing between the rails of 5 ft 6 in, this was, and still is, the widest rail gauge in common use anywhere in the world. The colonial Government of India started to build their own rail lines in the 1870s. These public-sector railways were more cheaply built than their private counterparts, and they were made in meter gauge (3 ft 3 3/8 in). Even after independence and the nationalization of the private railways, broad-gauge and meter-gauge lines continued to be developed in parallel with each other. 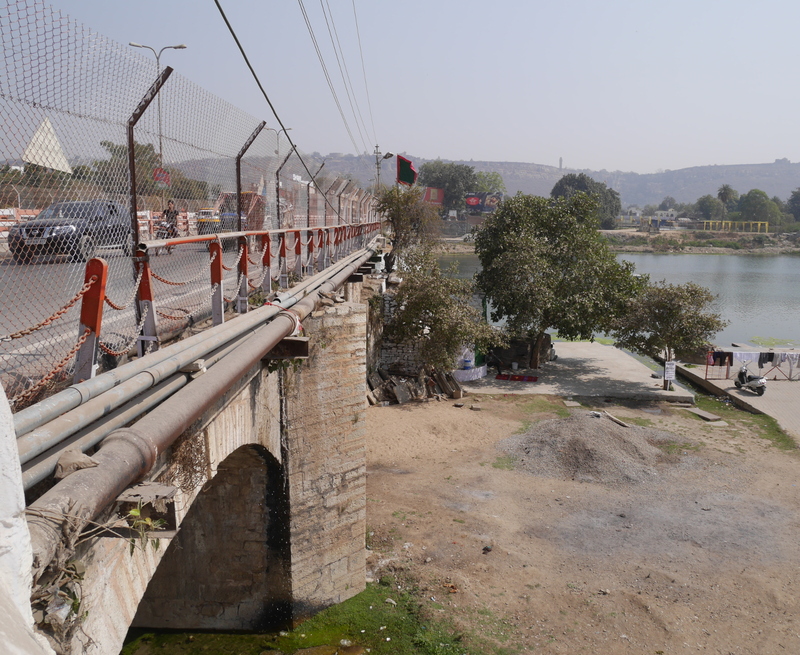 Only in the 1990s did the Indian Railways start to convert meter-gauge lines to broad gauge, under Project Unigauge. Since then, large stretches of meter-gauge lines have been replaced by broad gauge. Meter-gauge lines survive here and there. 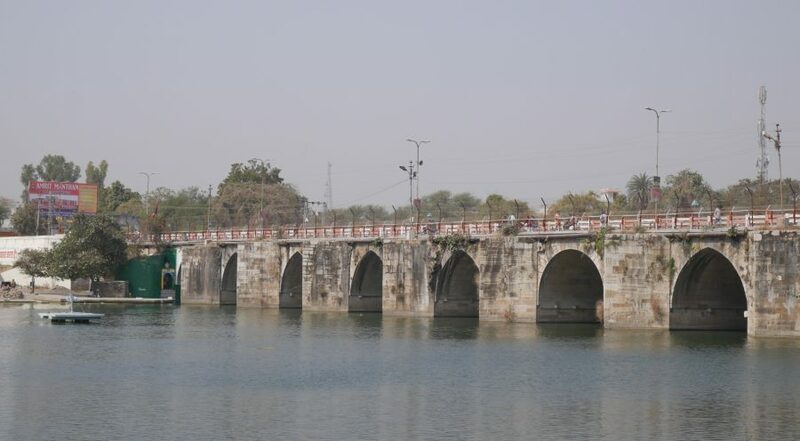 One such line runs between Jaipur Junction and Sikar, 107 km (66 mi) to the northwest. 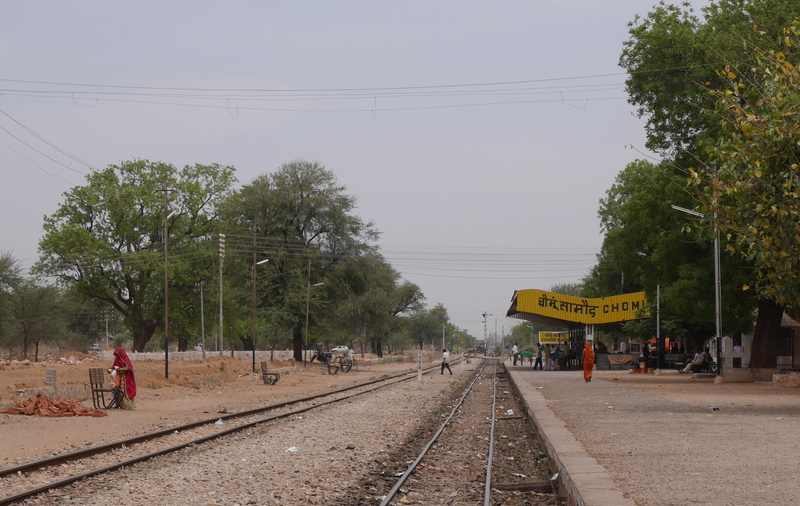 Meter gauge used to run all of the way to Churu, another fifty miles to the north, but that stretch has recently been closed for conversion to broad gauge. (The time table posted in Jaipur Junction station still says Churu on it, although the name has been whited out and replaced with Sikar.) Someday the Jaipur–Sikar line will also become broad gauge. But in the meantime, seven meter-gauge trains will continue to run back and forth between Jaipur and Sikar every day. 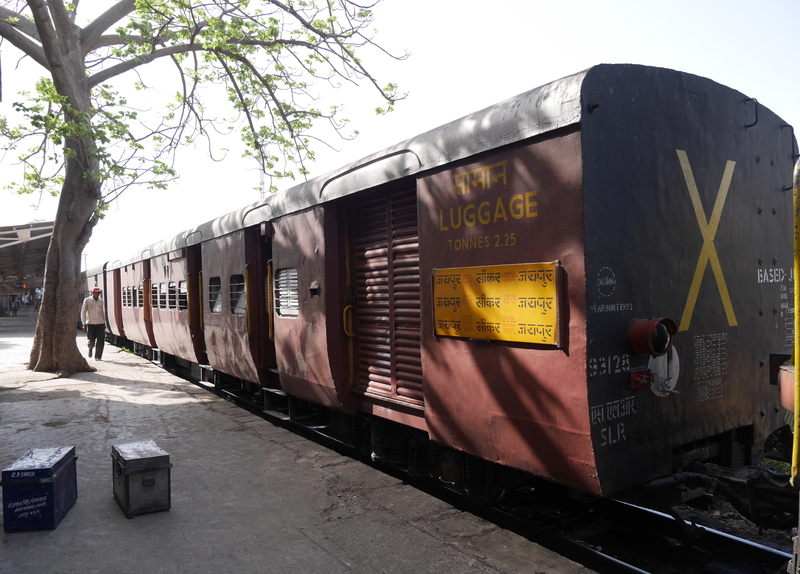 Since meter gauge won’t be around forever, I felt obliged to ride the Jaipur–Sikar train when I had the chance. 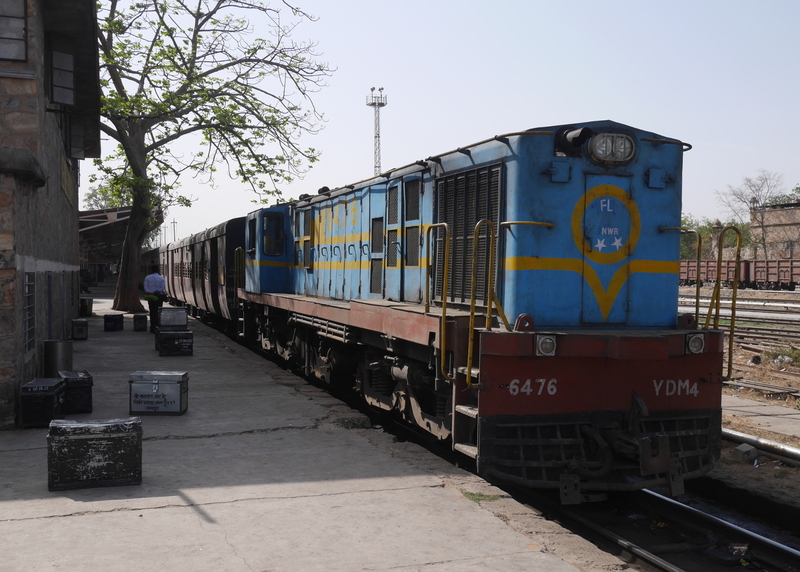 A month ago, I rode one of these trains from Jaipur as far as Chomun, one-third of the way to Sikar. 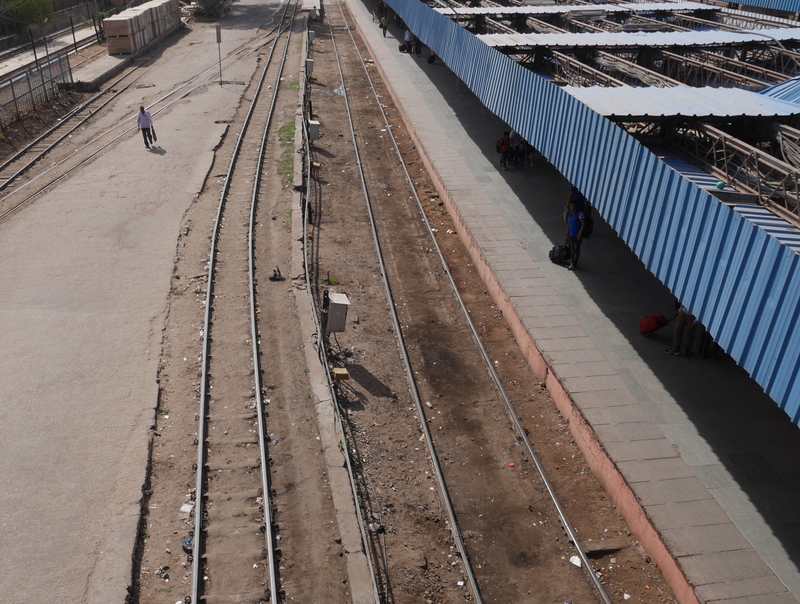 The meter-gauge tracks at Jaipur Junction station are on the north side of the broad-gauge lines, so the tracks don’t have to cross each other. I found a place where both gauges run side-by-side, showing the difference in size. Comparison of meter gauge (left) and broad gauge (right). The meter-gauge train was smaller and, I dare say, cuter than the broad-gauge trains I am used to seeing. Inside, the coach was just wide enough for a bench seating four or five adults. Meter-gauge locomotive of 52083 Jaipur-Sikar MG Pass train. Panorama of a compartment in a meter-gauge train. I sat in the coach just behind the diesel-electric locomotive, because that one was farthest along the platform and nobody else was in it at first. When the train left Jaipur station, only two other men were in my compartment. 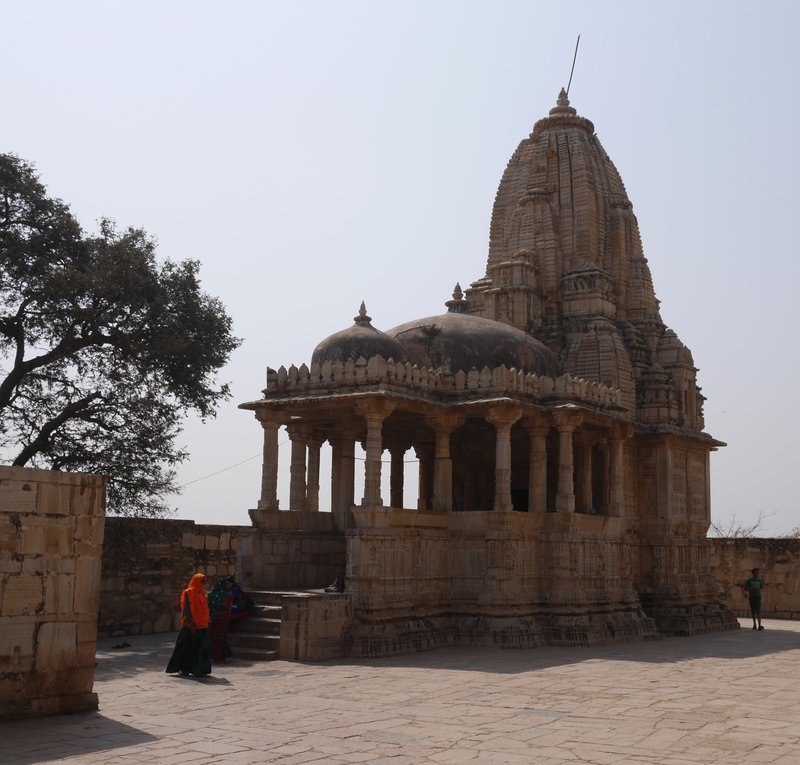 At the first stop, Dher ka Balaji, the compartment filled up. 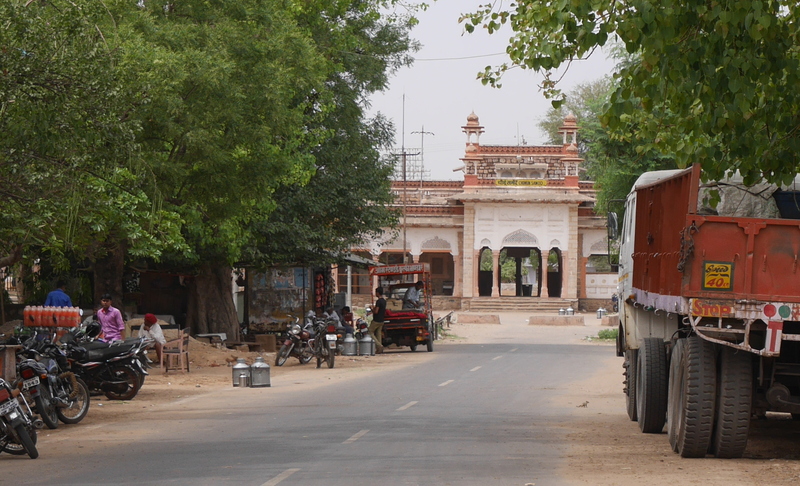 The train passed by Jaipur’s sprawl for a while, then it reached the open countryside. After several station stops that I didn’t see the name of, the train pulled into Chomun station, a nice little colonial Public Works Department structure. The single platform of Chomun Samod station. Glimpse of the facade of Chomun Samod station. At Chomun, my meter-gauge technological tourism came to an end. 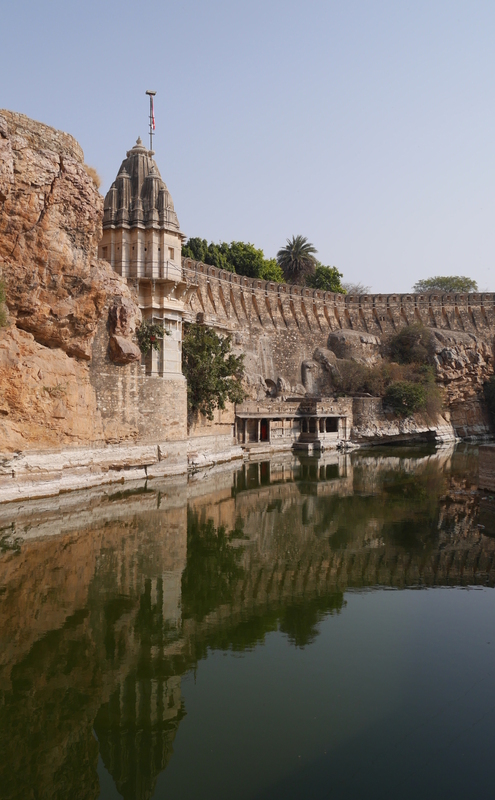 I returned to Jaipur by city bus. Having ridden on a meter-gauge train, I can now appreciate how much the Indian Railways have changed since the days when the narrower gauge was more prevalent. The train I rode to Chomun just didn’t have the capacity of the much larger broad-gauge trains I have ridden in India.